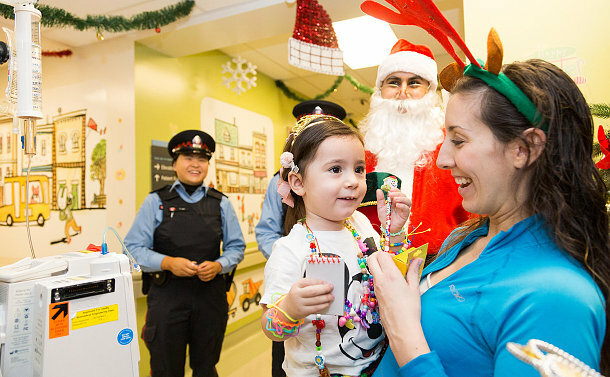 Auxiliary Officers brought Christmas cheer to kids being treated in hospital during the holidays. Auxiliary Officers stopped in on the Paediatric Department at St. Joseph's Health Centre on Dec. 21 to celebrate the season with kids and their families and deliver some treats to keep kids busy while being treated in hospital over the holidays. Auxiliaries packed 20 stockings full of goodies including Play-Doh, crayons, plush toys, candy canes, peanut-free chocolates and reindeer headbands to keep kids in the Christmas spirit and arrived with their own Santa to dole out the gifts they all pitched in to buy. "This experience was phenomenal and I hope to do this next year as well," Auxiliary Constable Alisha Bagga said. "We had a great welcome from the St. Joseph's team, who were very welcoming." She says the kids were often shy but warmed up to their visitors in blue, one girl putting on her princess costume for the visit. 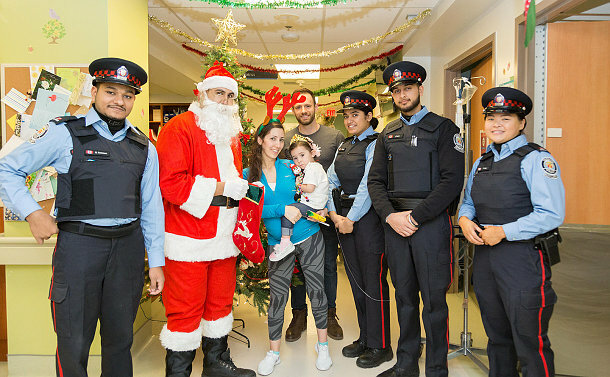 "It's great that we can bring a little Christmas cheer while giving kids a good memory of people in Toronto Police uniform," said Bagga, a University of Toronto - Mississauga forensic biology student. Auxiliary Officers Gulshan Summan, Gurminderpreet Dhaliwal, Inder Saini and Tiffany Lam supported the initiative their time and donations. Auxiliaries volunteer approximately 70,000 hours of their time annually to assist the Service’s community mobilization initiatives, crime prevention programs, special events, parades, searches for missing persons and emergency call outs. "Whenever I put on this uniform it makes me feel i can make a positive impact on people in the community even if it just is a simple smile to people I meet," Bagga said. "We get so many people who come up and thank us for our work, it's been such a positive experience."